A rate in the township of Newham dated 15th March 1823. 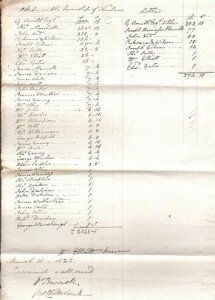 On one sheet of paper, c 20 x 32 cms, listing 46 names, giving the rental value of property on which they were assessed. Signed by the overseer Wm Elliott, as also by two who allowed and examined the assessment. Slight fraying along left hand margin, and a small hole towards the upper margin. This entry is filed under Manorial Records, Rentals & Tax Assessments. You can follow any responses to this entry through the RSS 2.0 feed. Both comments and pings are currently closed.